At the cutting edge of technology! Maximizes take-off and landing performance. 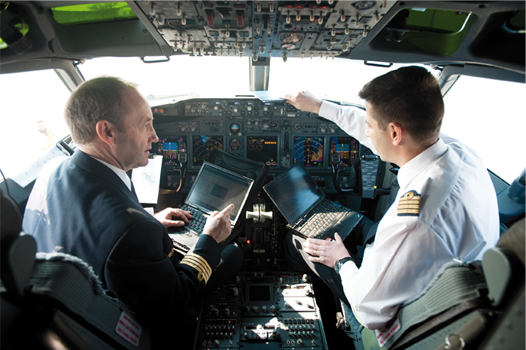 Rationalizes fuel management, air control information and weather information. Increases the reliability of, automatizes and manages communication in real time on board. Deletes the paper documentation of the flight crew. Provides quick flight quotes and estimates. Evaluates specific flight data according to destination. A 50% reduction of physical space. A 55% reduction of energy consumption. Immediate, permanent and seamless availability of all data, even when the network is under maintenance. Improved computing performance of data transfer speed and storage capacity.